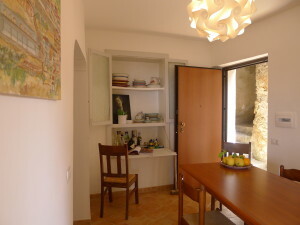 Casa San Marko is charmingly renovated house in the historical centre of Pisciotta. It sleeps 5 and has 2 large bedrooms, 4 beds, 2 large bathrooms, 2 balconies, laundry facilities and a comprehensive cook's kitchen with a scullery, dining area and views to the sea. Pisciotta is a Medieval town in Cilento, in the region of Campania in southern Italy. The village sits 150 metres above the sea. There is easy access to the beach from Casa San Marko by car or by foot. Situated in the historical centre of the village, you have ready access to all of the village shopping and services. Excellent local bars, restaurants and food. 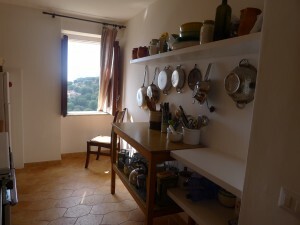 You will find exceptional holiday accommodation in Pisciotta at Casa San Marko. Casa San Marko is a charming, very old, recently renovated, private house, located in the historical centre of Pisciotta. The westerly aspect and balconies take full advantage of the light and generous views of the sea below and across the hills of Cilento. Guests are invited to enjoy the simplicity of this traditional Pisciottana home that comes with modern amenities. The thick walls, the balconies, numerous windows and doorways keep the house cool in summer time with gentle breezes passing through. Pale terracotta flooring and white painted walls, throughout the lower floor contribute to the cool and romantic ambience of the house. Hydronic heating is installed for your comfort during the winter months. Piazza Pinto is the main piazza in Pisciotta. Your taxi or bus will drop you here. Your key access and directions to the house will be coordinated at the time of your booking confirmation. From Piazza Pinto it takes less than 5 minutes (once you know your way) to get to Casa San Marko. For more detailed information on Pisciotta, the markets, restaurants, bars and beaches visit the Pisciotta page. As you enter from the shaded stairs of the village you arrive in the pleasantly appointed dining area. This is a delightful room in which to enjoy breakfast, a family meal or small drinks party with friends. A shuttered window overlooks the street below and has a deep windowsill – perfect to rest a bowl of lemons. Your eyes follow through from the doorway, to your left you see the adjacent fabulously appointed cook’s kitchen and the view through the window to the sea and hillside. Straight ahead you see a central room with an artisan built stairway. There is a large bedroom to the left of this room and a kitchen scullery and large bathroom / laundry, radiating off to the right of the downstairs space. The stairs lead to the main bedroom with ensuite bathroom and balcony above. You will find the kitchens and dining area to be well appointed with a considered selection of pots and pans, beautiful Italian cutlery, glass ware, bowls and dinner ware. A chair beside the kitchen window is a peaceful place to read, manage your correspondence or just relax and enjoy the view. The house comfortably sleeps 5 people.The downstairs bedroom is arranged with twin / double bed. The balcony overlooks the sea and has deck chairs to enjoy the view. There is a clothes line here. There is an additional single bed in the central room with the stair. Alternatively, there is space to accommodate this bed in either of the bedrooms. The upstairs bedroom is large with high vaulted ceilings and ancient chestnut beams. The red and grey tiled flooring is original. Iranian and Italian bedding, contribute to the peaceful feel of the bedrooms. The balcony doors off both bedrooms open onto views across the sea and to the countryside. Both the ensuite bathroom and main bathroom are comfortable and of good size, each featuring a large walk in shower, ceramic basins, bidets and toilet. A washing machine is installed in the large downstairs bathroom. The stair is unprotected but has a rail against the wall. For this reason, this house is not suitable for young children to visit or stay. There is a scullery to the left of the central room with the stairs. This is cool enough for the storage of food wine and water and provides additional space for the preparation of fruit and vegetables over the large ceramic basin and bench area. We hope that you will find that a holiday in Casa San Marko allows you to enjoy the very best of a traditional Italian village experience. Two large double bedrooms with western facing balconies and sea views. Well equipped cook’s kitchen, also with sea views. Separate Sitting room which can convert to 3rd bedroom. Our housekeeper Francesca only speaks Italian. I am available to you by telephone or email during your stay. I live in Australia but can assist you by telephone or email as necessary. I am happy to assist you with travel and transfer and orientation information for your stay. I urge you to contact Luigi Gatto, owner of a local Travel and Tours Agency in nearby Palinuro – Cilento Viaggie, Via Acqua dell’Olmo, 248, 84051 Palinuro. Telephone +39 0974 931362 or email info@cilentoviaggi.com for travel information and bookings. Luigi can also assist with local car hire, bus and boat excursions to the Blue Grottoes of Palinuro, Capri and the archeological sites of Paestum and Pompeii. Luigi can help with organising your flight, train and further hotel bookings. He speaks English, is a friend of mine and while he works in Palinuro he lives in Pisciotta. You can only access the house by foot and some stairs. There is only pedestrian access throughout the historical centre of the village. Having to walk everywhere means automatically that you are living differently to how we live at home. There is no need to have a car to visit Pisciotta but that said it is nice to have one to explore the beautiful surrounding beaches, wineries and restaurants. Increasingly cyclists are visiting this area of Campania. For a more detailed description of Pisciotta and the surrounds please visit our Pisciotta page. 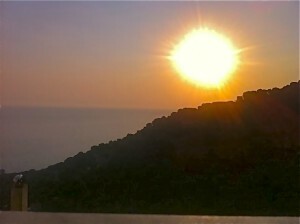 Nightly rate is 60 Euro per night for 3 people and 10 euro each for the fourth and fifth person. For the month of August there is a flat nightly rate of 115 Euro for 1 – 5 guests. Cleaning fee is 50 Euro per Stay. Long stay guests receive complimentary 2 hours cleaning each fortnight. Additional hours may be negotiated at 10 euro per hour. Book with Anunziata directly or coordinate through me. All linen, towels and bedding are provided. Simple toiletries, laundry powder, cleaning and dishwashing liquid and some basic pantry items are supplied. All payments are made in euros and made by electronic funds transfer into my nominated bank account. All bank transfer fees are the responsibility of the guest. A 25% deposit is payable on booking and the balance must be paid in full 30 days before your stay. Your booking is not confirmed until the deposit is received into my bank account. Failure to make the balance payment 30 days before your scheduled arrival may result in you losing the booking and the deposit. A 150Euro bond is collected at the time of check in. This is refunded within 7 days of departure. Please notify us of any breakages and you will be asked to replace broken items with same. Most plates can be replaced from the gift shop at Tre Guefi. Broken glass ware and other items will be taken from your bond. You are asked to advise me by messaging or email of all breakages and damage before your departure. 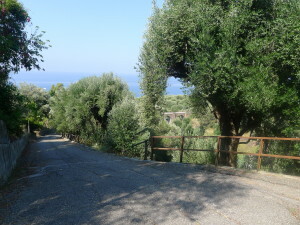 It is a privilege to live in the historical centre of such an untouched village as Pisciotta. Other than in Ferragosto when there are many visitors in the village, the streets are extremely quiet. You never hear a television, other people’s music, raised voices or even children crying. We ask our guests to respect this tranquility and choose to come, partake and share in this wonderful experience. Please do not disturb our neighbours. This is their home. Rubbish collection and recycling is taken extremely seriously throughout Italy and especially in Pisciotta. Information about this is detailed in your guest information package. Failure to comply will mean that your rubbish will not be collected, the cats may get into bags incorrectly sorted and left out and you will be entirely at the mercy of the local signore! Good luck with that! For any reservation enquires please contact us using the button below. food, hills and beaches were all fabulous.